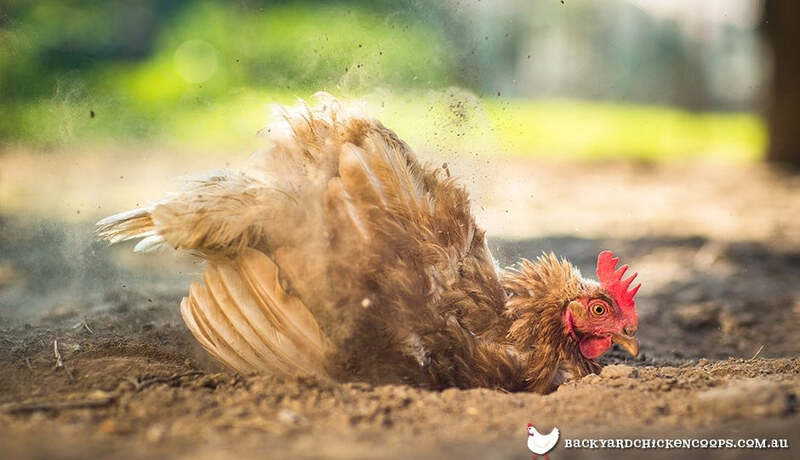 If you’re new to the chicken keeping game, the act of a chicken dust bathing may alarm you at first- writhing and squirming around in the dirt isn’t exactly the most normal looking thing you will witness! While it may be entertaining for you, dust bathing is also a very important ritual for chickens, serving the purpose of keeping their feathers clean, and keeping them free of mites, lice and other parasites. Basically a dust bath is the chicken equivalent of a shower- they get dirty to get clean, as strange as that may seem. 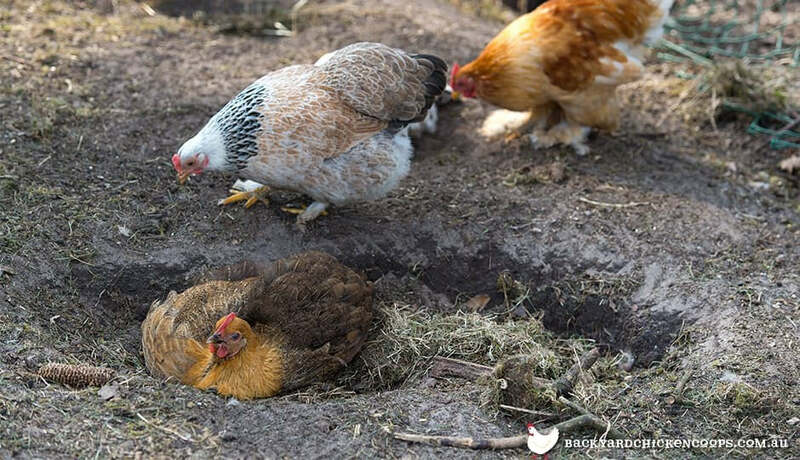 When chickens start to feel a little bit dirty or gritty, they will dig a shallow ditch (in soil, mulch, sand, or other dry, loose materials), in which they will burrow and throw the dirt over themselves. They will do this until the dirt has coated their feathers and is settled down to their skin- where it is believed to absorb excess moisture and oil, and clog the breathing pores of parasites that may have found their way onto your chicken. They will then stand up and shake out all the dirt- so be sure to be standing away from the action, then proceed to preen themselves before getting on with their usual chicken business. Like mentioned earlier- dust bathing is the chickens way of keeping themselves clean (just like we would bathe a dog, or shower ourselves), it just happens to be a more distinct, and quite frankly, odd way of doing so. It also acts as a natural insecticide and helps to keep parasites and other nasty creepy crawlies at bay, so it is important for their health! Dust bathing is also a relaxing and even social pastime for chickens. You will often catch your flock bathing together- squirming and flapping around with glee! If your chickens are confined to a coop, or their run is all luscious grass and minimal dust, you will need to provide your girls with an adequate space where they can happily dust bath. Make sure you choose a nice dry and sunny spot- your girls prefer to perform this activity in the sun, especially in winter. There are a number of materials besides dust and dirt that you can add to the dust bathing area to make it a little more enticing for your girls. This is a very welcome addition to your dust bath, although be sure to only use wood fireplace ash- not wood that may have had lighter fluid or other chemicals come in contact with it. Not only does it add some extra loose material to the dust bath, but charcoal wood ash actually contains Vitamin K, calcium and magnesium, and absorbs toxins, so will provide medicinal benefits for your girls. So don’t be alarmed if your girls nibble and peck at it as they bathe- it will do them a world of good! While some backyard chickens keepers refrain from using diatomaceous earth (DE) due to believed possible health risks for humans, it’s ability to kill mites, lice, fleas, ticks and other parasites make it a great additive to your dust bath- especially if your flock is struggling with a parasite problem. It is important to be cautious when handling DE, as it can become a lung irritant if inhaled, so be sure to wear a mask when applying it to the dust bath area. A fine sand is the number one dust bath ingredient! It is great for cleaning feathers, and also assists with killing parasites such as mites, lice and fleas. Your girls will love squirming about among its grainy texture- relishing all it’s goodness! There are a number of herbs that are beneficial to your chickens health, so dried herbs sprinkled in their dust bath area can help to harness these health benefits. Dried lavender, rosemary and mint are all natural insecticides, so will help to prevent pesky parasites. Thyme and rosemary are great anti-inflammatories, so will promote a healthy respiratory system. There are a number of different herbs you can add to the dust bath and coop that assist with different ailments, for a more comprehensive list be sure to check out our Herbs for Hen Health articles on the Learning Centre. Despite how much effort you put in for your girls, they will choose to bathe where they want to, not always where you want them to- especially if they are in a free range environment. So be prepared to have them shun the delightful bath you spent so long lovingly preparing! If you have set up a specific dust bathing area for your flock, you need to make sure that the area is maintained so it can serve it’s purpose of keeping your girls squeaky clean! 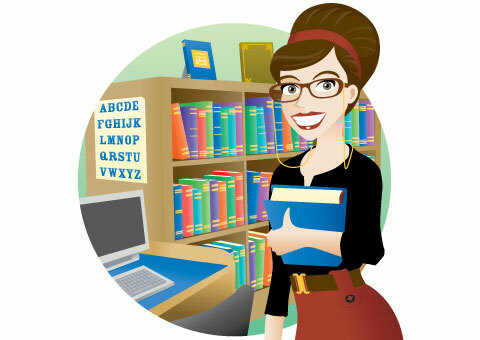 Clean out bird droppings regularly, and completely refresh the contents every few weeks. If you want to have super clean, bug-free chickens, provide them with adequate dust bathing facilities! Our Penthouse and Mansion coops both have expansive runs that are perfect for housing a number of dust baths- talk about spoilt for choice!